Sometimes it’s the smallest details that set one wedding apart from the rest. Some little touch that gives a big day that added extra … a glimmer of personalisation. I’ve been noticing how ribbons are being used at weddings – as décor, to tie bouquets, to trail in flower arrangements, on stationery and of course on wedding dresses and bridesmaids frocks. So here are a few ideas I’ve spotted. When your bridesmaids are standing at the ceremony in front of all the invited guests, it’s going to be the back view that’s on show – also when they walk down the aisle behind you. 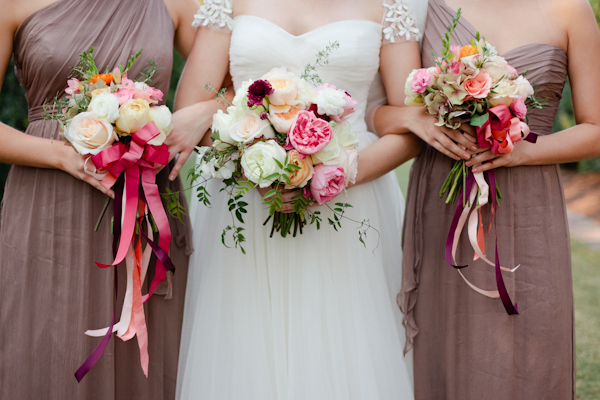 So think of adding details like bows to your bridesmaids’ dresses. No matter how simple the flowers at your wedding, you can create something spectacular by tying a bouquet with a trailing ribbon. Use different colours to match your wedding theme (or co-ordinate with your bridesmaids’ frocks). A long silky ribbon will make a bouquet look extra classy and super romantic in your wedding photographs. Don’t forget to use the ribbon theme when you send out your wedding save the dates and invitations. A ribbon adds a sophisticated tone to an invitation and will make it stand out on a mantelpiece. Again, use different colour shades to match your theme. So what about your wedding venue? This is where you can really indulge yourself. You can use ribbons to decorate your wedding chairs … to create a garland around a table. If your venue has a less than pretty ceiling (but otherwise it’s perfect) our stylists can create a canopy of ribbons to camouflage a surface. Streams of ribbons are also useful for ‘softening’ a room that may seem a little clinical. And what’s more, our stylists are professional bow makers. Tying a ribbon to create the perfect bow is a real skill – you need the bow to sit flat and for both sides to be even – a talent that’s second nature to our team. Our experienced wedding stylists will also have their own props – including ribbons in different colours – to bring to the party. So you won’t have to scour haberdashery shops up and down the country or online to find the perfect shade. Because our stylists are experienced in bringing a wedding ‘look’ together, they’ll almost certain have the right type of ribbon – whether you want something satiny, velvet, striped or quite different entirely. For a chic city wedding, a black and white theme with ribbons to match looks wonderful. On the other hand, if you’re having a more rustic, country style of wedding day, then you could opt for a gingham ribbon (how perfect would that look tied around a bunch of countrystyle flowers)? If you want to talk through your ideas with one of our stylists you’ll find one local to you. And if you’re planning on using ribbons for your wedding day, create a moodboard using a free scrapbook like Pinterest in the meantime. It’s always good to try and get your ideas together in one place so that you can talk them through. Don’t worry at this stage about having ultra-creative thoughts. You can always tone them down later but our stylists will be able to interpret your taste much more easily if you’ve put a lot of images together. You don’t have to use a single colour either. Mix and match things up a little. Put black with white. Orange with lime green. Or opt for an ombre effect – that’s when you have the same colour in graduated shades – for example a soft petal pink moving down to a deep aubergine, with every colour in between. Tie your wedding theme together with ribbons and get in touch with one of our stylists today to see how they could help you.